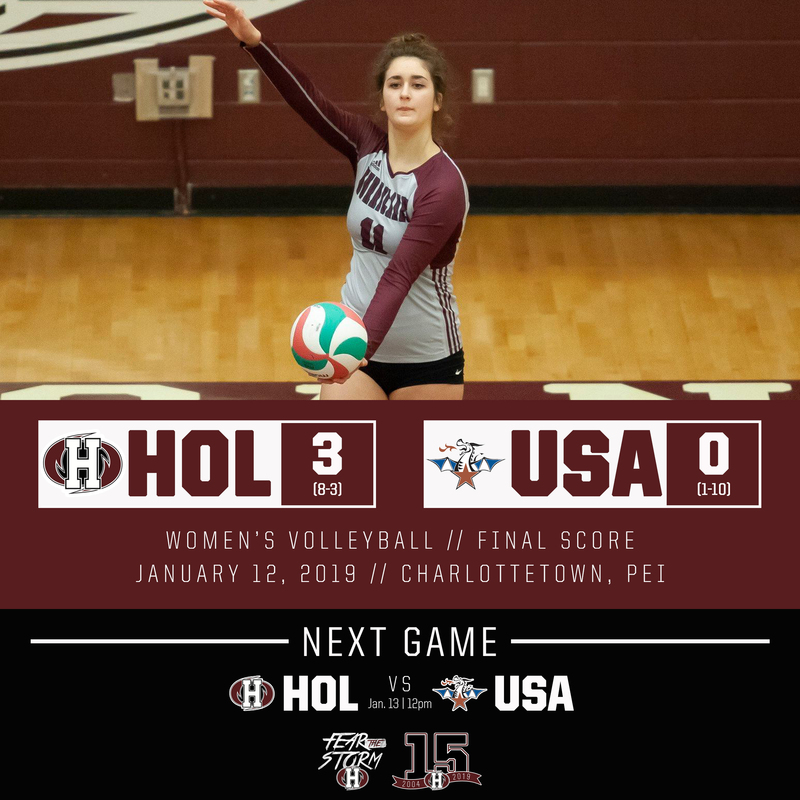 The Holland Hurricanes men’s and women’s volleyball teams won three of their four matches over the weekend with the women defeating the Université de Saint-Anne Dragons at the Holland College Centre for Community Engagement, and the men splitting their road games versus the UNBSJ Seawolves. Set scores in the women’s match on Saturday versus the Dragons were 25-13, 25-15, and 25-11. Jasmine Smith had nine kills in her Hurricanes debut to lead the way with Abby Hyndman and Brittany States each recording six. Zayley Murphy started at setter and recorded 26 assists with Taylor Allen and Laura Ready sharing libero duties and recording 12 and ten digs respectively. On Sunday the ‘Canes earned the win with set scores of 25-8, 25-13, 25-18. Ready had seven kills to lead a balanced offensive attack. Smith added five with Philicia Taylor and Lauren Moerike each adding four. Murphy had a match-high 22 assists, while Allen recorded a match-high 14 digs in the win. The Hurricanes move to 9-3 on the season and sit in second place in the ACAA standings. The Dragons fall to 1-11 on the season and are tied for seventh in the conference. The women’s Hurricanes return to the court on Saturday when they host the STU Tommies before the MSVU Mystics are in town for a match on Sunday; both games take place at the Holland College Centre for Community Engagement. 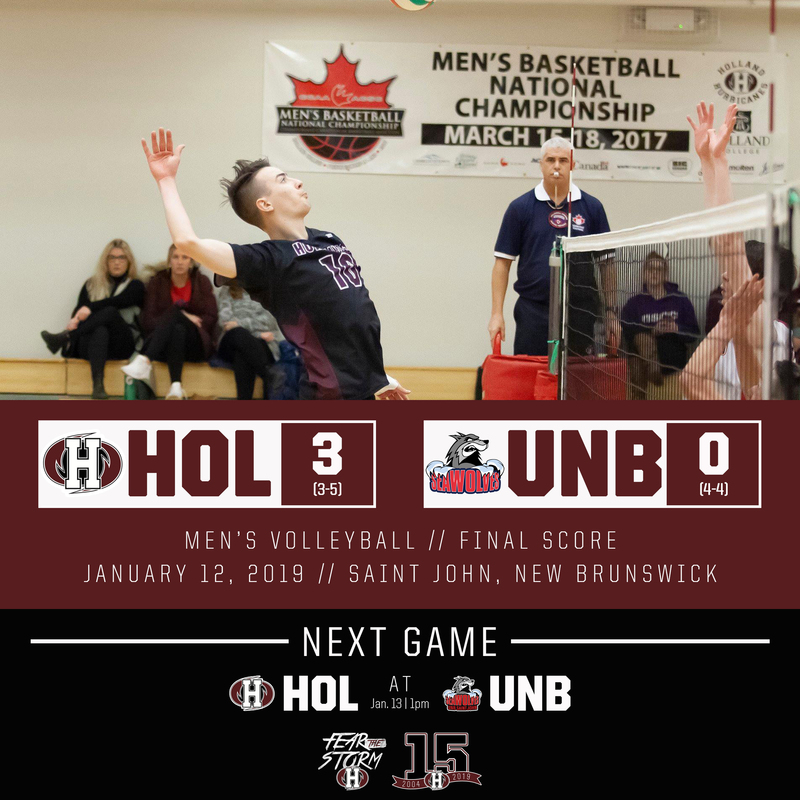 In the men’s game on Saturday, the ‘Canes were victorious by set scores of 25-14, 25-17 and 26-24 in the straight-sets sweep over the UNBSJ Seawolves. Brett Butler recorded ten kills to lead the offensive attack for the Hurricanes with Jeff MacDonald and Simon Archibald each adding seven. Nicholas Menzies had 27 assists while Butler led the way in digs with seven. In the rematch on Sunday, the Hurricanes dropped a back-and-forth match in the fifth set. 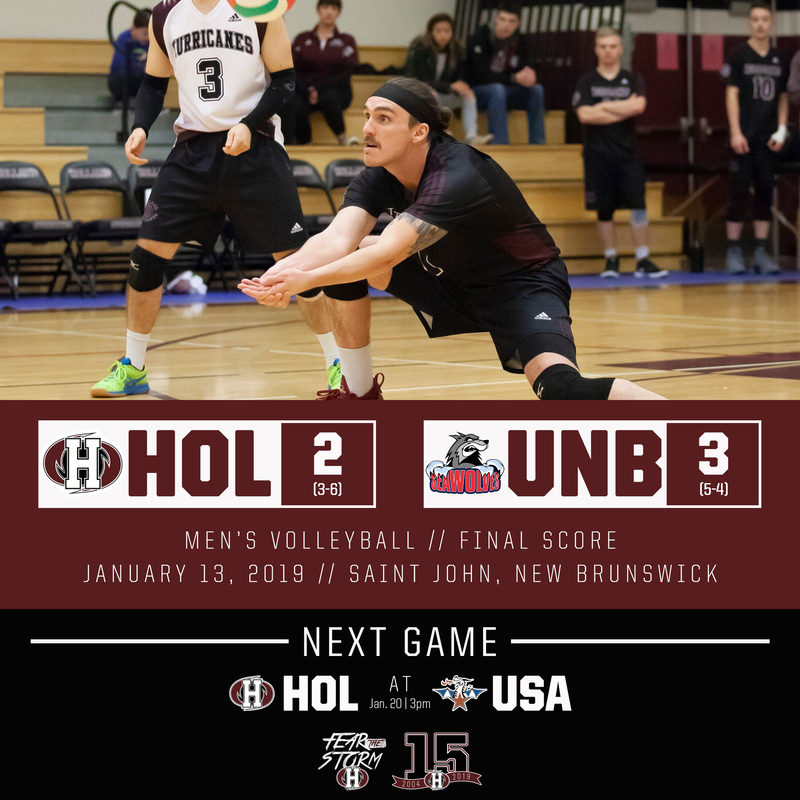 Set scores were 26-24, 23-25, 20-25, 25-19 and 20-18 in favour of the UNBSJ Seawolves. Archibald had 15 kills to lead the offense for Holland College with Riley O’Keefe and Brett Butler both adding 12 and MacDonald chipping in 11. Nicholas Menzies had a match-high 46 assists. 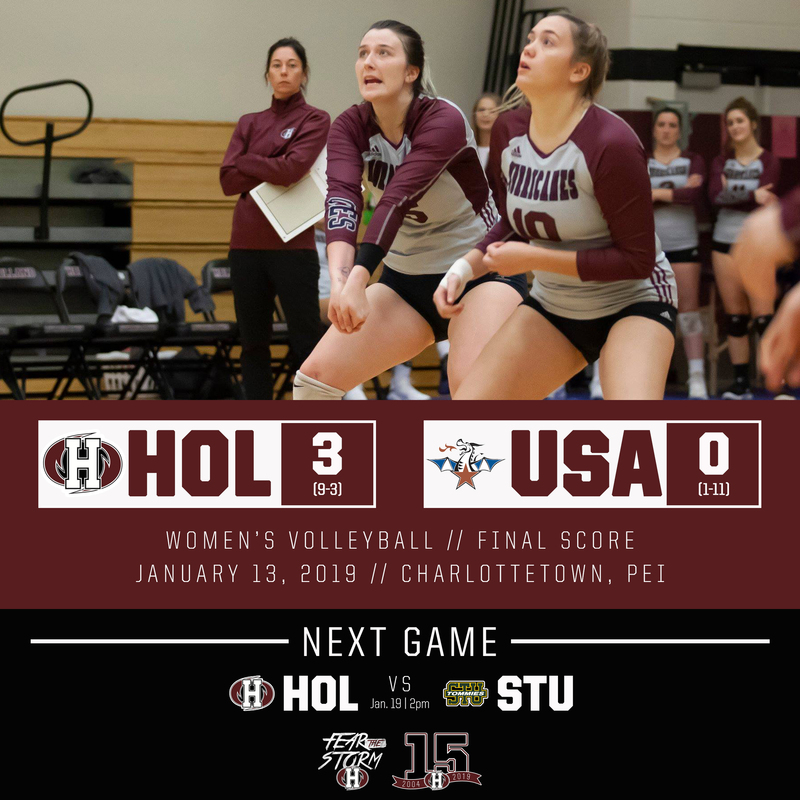 Butler and Marcus Lapointe each had 15 digs with MacDonald adding ten in the loss. The ‘Canes are now 3-6 on the season and in third place in the ACAA standings while the Seawolves are in second at 5-4. In four meetings this season between the two teams, three have ended in five sets, with the Seawolves taking all three victories. The men’s Hurricanes are back in action on Sunday, January 20 when they visit the Université de Sainte-Anne Dragons. Their next home game takes place on Sunday, January 27 when they host the UNBSJ Seawolves. For more information on ACAA volleyball please visit www.acaa.ca. To connect with the volleyball Hurricanes please visit www.twitter.com/caneswvball and www.twitter.com/canesmvball.